Long (long!) ago, I made the blocks for this quilt. I just took a look back, and in December of 2013, Hawthorne Threads sent me a bundle of their new solids, Hawthorne Hues. 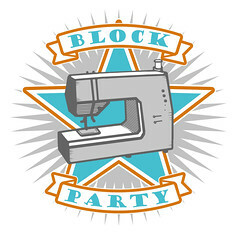 I made up several fun blocks incorporating all those great solids and blogged about them here in June (I feel badly about how long it takes me to use some of the fabrics I’m so generously sent!). 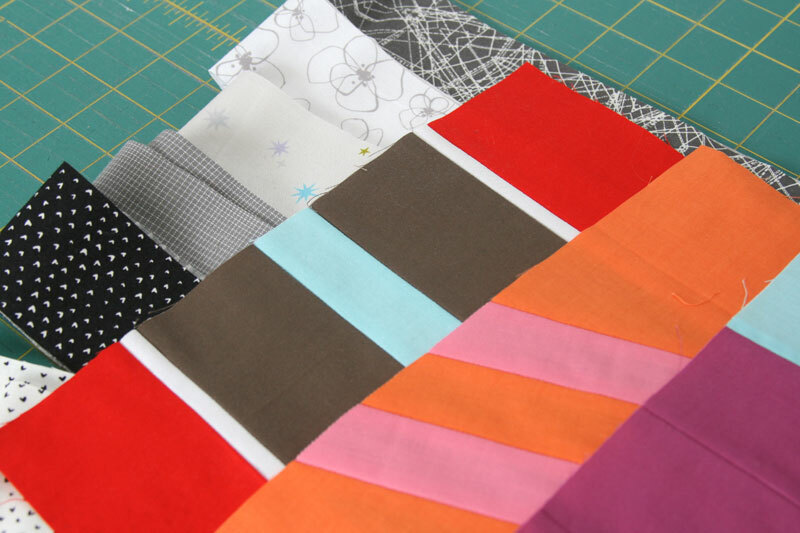 Anyway, their fabrics are wonderful – really nice to sew with, and I had a lot of fun putting together these blocks. They’re inspired by painted oars I saw in a magazine around that time (Crate & Barrel, maybe?) — [Nope, cb2 – here’s an image of the inspiration]. I love the nautical feel, and it was a fun challenge to come up with designs that fit that feeling. I made up a bunch of blocks and then was totally stumped by the layout and sashing. That post from June shows I was looking at Robert Kaufman Essex yarn dyed fabrics as an option, and I think I toyed with a number of colors of Carolyn Friedlander’s crosshatch print. When I pulled the blocks out again after our move, I was no closer to an answer, so I ordered a bunch of additional sashing possibilities but still couldn’t commit to one (good for those shops I ordered from, not so good for my wallet!). In the end – mainly just to get it off the design wall – I went with the black cross hatch print by Carolyn Friedlander, one of my first options. I did get to use one of those other sashing options for backing, so all is not lost. Now I’m stumped on how to quilt it. It’s been basted for several weeks now and remains pinned to our bedroom carpet, making it a challenge for Morgan to get to bed. I’m hoping I figure it out and get it finished in time for boating season! I think this is fabulous! I love the colours and shapes! Do you have any plans for sharing a pattern for it? I love the colors in your quilt, but I have no opinion on the quilting. I send my quilts to a longer since, by the time the top is pieced, I’m over the quilt and ready to move on. 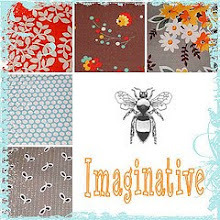 Hope you come up with a quilting pattern that is as beautiful as your top! Que bonitooooo, me gusta muchooo. Love it. I, too, would welcome a pattern for this one! I love the ever loving stuffing out of that top. As for what to quilt, hmmm. I love the blocks so much I might just say SID it all and do some matchstick quilting on the sashing/background and call it good. It’s begging to be snuggled under already! why not quilt it with paddles? in neat rows as if they were resting upon a wall? This is a fabulous quilt top! I have loved watching it come together! I love this top and I thought the sashing was some kind linen or chambray before I read your description. As for quilting, i would go for matchstick or grid quilting. I think a neutral grey or even transparent thread might work well. It is so graphic, i would want the quilting to all but disappear. If I were to matchstick it, I would do each row a different direction, alternating between vertical and horizontal. More work yes, but interestingly worth it I think. Love it! My boys were avid high school rowers and my eldest son established crew at his university. I have wanted to incorporate oar designs into a quilt since I picked up the passion a couple of years ago. I’d love to know which schools and clubs your oars represent. I’ll have to do some research. Rowing is such a majestic sport. What a wonderful quilt. Hope you decide to put out a pattern. Not that you asked but I think I would quilt it with uneven wavy lines 😉 . Thank you for sharing your talent. Love the solids . I haven’t done a quilt in solids in a long time. You inspire me. 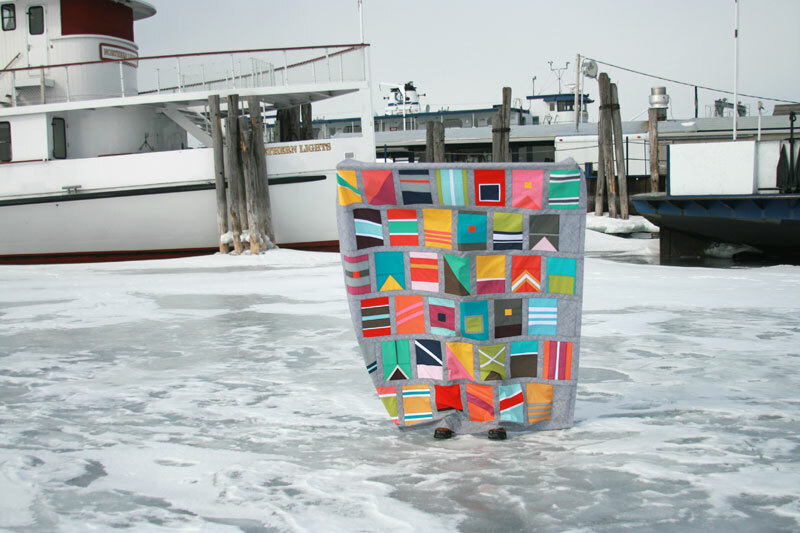 What a colorful quilt! I love all the latest shade of color. As a longarm quilter, my recommendation would be figure 8 quilting. That looks great on so many quilts. Pattern, too, please, please, please! Because the quilt is so linear I, personally would opt for quilting that is the same. Right now, prior to quilting, the lovely flags you have designed are the highlight, I would try to maintain that aesthetic. Maybe just quilt your background? I’m finishing up a quilt now and would love to start one just like this for Summer. I enjoy your work so much and find it incredibly inspiring! Thanks so much for all your hard work, and, for braving what must have been freezing temps to photograph this beauty! This is one of my most favorite quilt tops. LOVE it!!! And of course, the photos are fabulous. Who cares how long it takes-it looks so fabulous! Just beautiful- as are your photos! 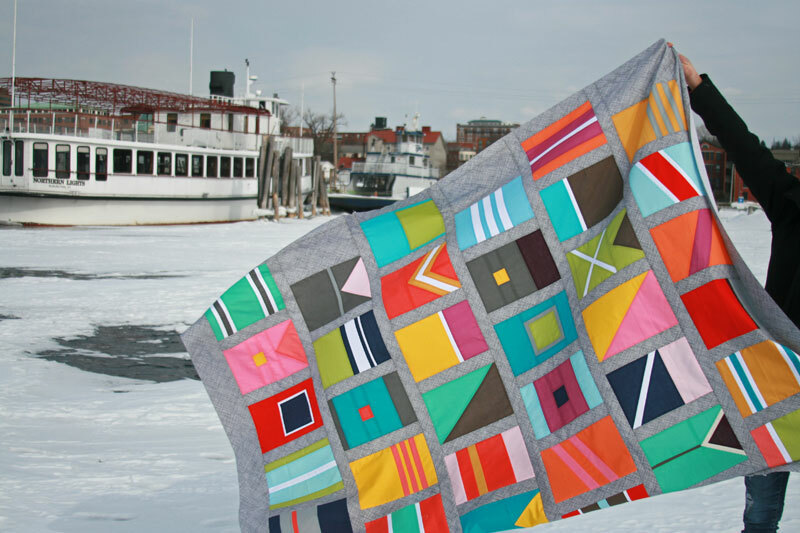 I’m a rower, ultimately I love this quilt!